I had planned on posting a New Year type post this week. But alas life has gotten in the way. As many of you know I am currently in graduate school working toward a Masters in Counseling. My hope is upon completing school I will be able to help others like me, who’ve watched their life fall apart. As part of my school’s program I have to pass an oral exam to graduate. I have to present a client case study to a panel of professors, and then defend my case study. This is a very involved process, and my deadline is rapidly approaching. As a result, throughout the month of January and most of February, I will be consumed with preparing my case study and doing the appropriate research. I would appreciate your prayers during this time. To help relieve some of my stress and anxiety, I won’t be posting on the blog as much as I had intended during this time. As soon as my oral exam is over, I have many plans for this blog. So stick around because exciting things are coming. So instead of writing the New Years post I’d planned on, I thought I would share something I posted on my photography blog in January of 2013. If you are interested in my photography you can check it out here. Without further ado, I’d like to share a side of Mary, the mother of Jesus, that I’ve wondered about. A few weeks ago I was listening to one of my favorite Christmas CD’s. A song titled “Still Her Little Child” came on. As I listened to the song I realized something . . . Mary, like myself and so many mothers I know, was a grieving mother. She watched her oldest son be tortured and put to death in the most horrific fashion. She had to bury her baby boy. For 3 horrible days she knew the unimaginable grief of loosing a child. But Mary received a gift all grieving mothers can only dream of . . . . she got to see her son again. A mere 3 days after being buried, Jesus came back from the dead. What overwhelming joy and relief Mary must have felt. However, several days later Mary lost her son again when he ascended into Heaven. And here is where I’d like to pose a question for your contemplation. 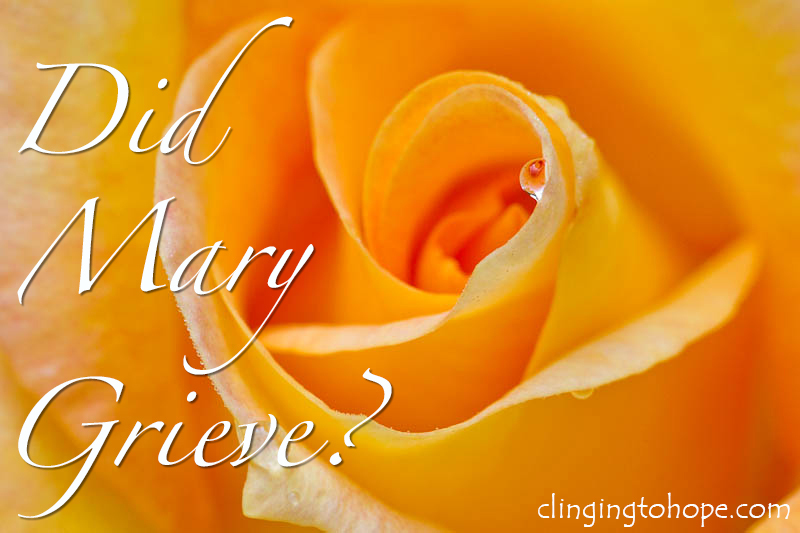 Did Mary still grieve the loss of her son after he ascended to heaven? I think she might have. For even though she was able to see her son again, he was still gone. Even though she was able to see Jesus in his full glory, he was still gone. Never again in her earthly life would she be able to talk to, touch, hug or hear her son’s voice. In the end that’s all we grieving mothers want to do. We want to hold our children, to talk to them, to hear their voice, to smell their presence, to touch them and to have them touch us. We don’t cry and grieve for our children. We cry and grieve for the LOSS of our children . . . for what we no longer have. And that is why I think Mary grieved for her son until she joined him. Im not sure on this one. would love to here your comments..
Anyways, that question led me to google it and I discovered your site which is a gift from God and today is my birthday. Thank you, I love your site and it has brought me much needed hope. Lisa, your comment brought tears to my eyes. I’m so sorry for your loss. I can’t imagine the all the pain you must be feeling. I’m so glad my sit has brought you some hope. I started this blog with the hope that my story would help others. You gave me a great gift in letting me know how it’s helped you. It’s Been 4 Years . . . .